This section provides a tutorial example on how to turn on Windows Defender for real-time protection on Windows 8 systems. 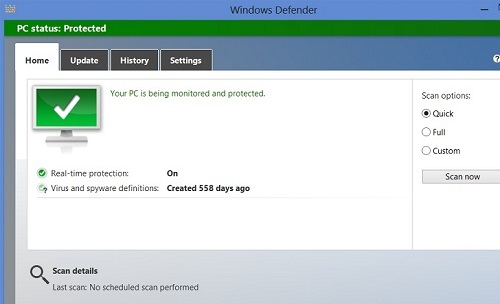 To try Windows Defender on Windows 8 system, you should turn it on first. software, use Action Center to check that app's status. Your PC is being monitored and protected. Your virus and spyware definition haven't been updated lately. You should update them now to help protect your PC. 5. Click the "Update" button. Windows defender will start to download the latest virus and spyware definition from Microsoft. When update is done, you the status will change to "up to date".